SDI2USB 3.0 is the industry standard for capturing and recording uncompressed, production-quality video at up to 60 fps directly from 3G-SDI, HD-SDI, and SD-SDI sources. 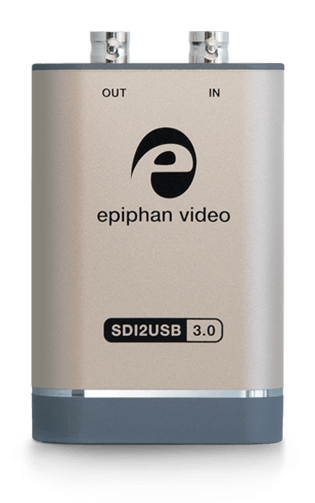 Simply connect your SDI video input to your Windows or Linux computer using USB 3.0 and access the Epiphan Capture Tool for easy preview and recording. The SDI input port is designed to capture video signals from 3G-SDI, HD-SDI, and SD-SDI, including embedded audio. Connect a monitor or projector to the SDI output port to monitor your SDI signal in high resolution. Rugged yet lightweight design is ideal when moving from office to boardroom, laboratory, or anywhere you need to capture and record SDI video. Powered over USB, SDI2USB 3.0 eliminates the need for an AC power connection. The device contains no internal fans or other moving parts for silent and reliable SDI video capture. For custom software development, download the SDK from our website to design your own application that interfaces directly with Epiphan drivers. Capable of transferring uncompressed SDI video to your computer or laptop in beautiful Full HD at 60 fps. Supports USB 3.0 and USB 2.0 data uplink. SDI2USB 3.0 solves the problem of how to effectively transfer SDI video content from a professional-grade video mixing console to a laptop or desktop computer. Choose to record your SDI as a single video file or as a series of individual graphic files. Provides true 24-bit color and consistent frame rate performance regardless of video content. Captures flawless, uncompressed SDI video in YUV 4:2:0 color formats. All Epiphan USB capture cards come with our free capture software and drivers which provide a seamless interface to a wide range of industry-standard encoding and streaming software. To maintain the highest standard of product performance, we issue occasional upgrades to our video capture cards completely free of charge. 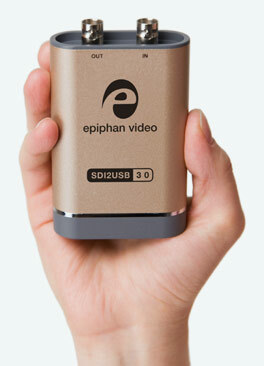 Your Epiphan video capture device notifies you when a firmware upgrade is available for download. 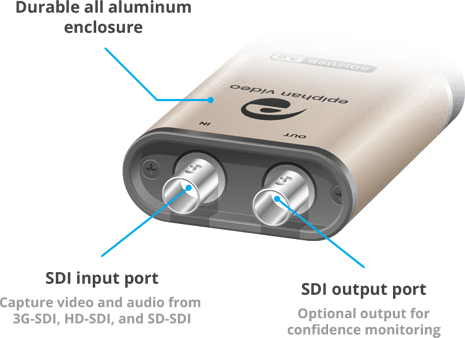 In addition to the free Epiphan Capture tool, SDI2USB 3.0 works with multiple third-party applications for Windows and Linux through DirectShow and V4L2 respectively. This allows the captured SDI video to be used in many different streaming, recording, and conferencing applications. These include, but are not limited to: Windows Camera, VLC, Wirecast, OBS, vMix, XSplit, Skype, and Google Hangouts. SDI2USB 3.0 comes with all the cables and connectors you need to capture 3G-SDI, HD-SDI, and SD-SDI signals.